The author’s working life is a solitary one. No one else can translate the data in a writer’s head to the screen or notebook. The task is theirs alone, a one-person job. In the quiet of the office, the shed, or the corner of the dining room table (in my case), the writer has to delve deep into the core of creation, isolating themselves even further from their environment. All in the hope that a seed of narrative will germinate into a riveting story. Every now and then, it’s important to come out of the shell and discover what’s going on in the real world. Batteries need to re-charge, and tribulations or successes need to be shared with other like-minded creative souls. There’s no better place for this than at a writing festival. I recently returned from one of the world’s best-known gatherings, the Theakston’s Old Peculiar Crime Writing Festival in Harrogate. Besides the excuse to drink bucket-loads of the sponsor’s beer (or in my case, prosecco) it made me realise that there’s an incredible support group of people out there at all levels of their writing or reading career who simply enjoy getting together from time to time to mingle with those who are passionate about crime fiction. Harrogate sees authors, readers, bloggers, avid fans, and representatives from the publishing industry gathering in and around the historic Old Swan Hotel. The event offers a pre-festival creative writing day to new authors still honing their narrative. The weekend’s panels with published authors discuss subjects ranging from trends in current crime writing, and what makes a gripping crime novel, to the presentation of ‘new blood,’ debut novelists who have recently stepped onto the first rung of the publishing ladder. Apart from various publisher parties and author interviews, two unaffiliated events took place over the weekend, which were a complete hoot. On Friday we packed into Hales Bar for the Noir at the Bar event, where a selection of authors read excerpts from their most recent works. The other was a football match between the Northern and Southern writers, when literary eloquence was most certainly set aside, and football demons were revealed by authors who spend most of their year in sedentary writing mode. Don’t be fooled by what’s behind the premise of a crime novel. Crime writers are some of the nicest people you will meet. We leave all our grime and gore within the pages of our narrative when we put on our posh frocks and don our drinking hats at these events. We are the easiest people to come and talk to. The warmth and buzz at Harrogate was infectious. Literary mana for the soul. 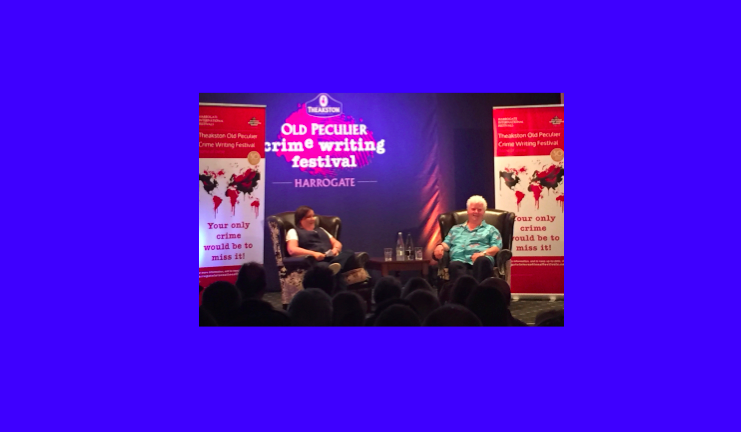 There was a lot of laughing, especially at my favourite event (pictured above), comedienne and author Susan Calman interviewing best-selling crime author Val McDermid. Theakston’s at Harrogate wasn’t my first festival of this kind. In spring I attended CrimeFest in Bristol, and was astounded by the easy-going, approachable, crime-writing community. I can highly recommend attending such an event, wherever you are in your writing career. I have come away buzzing from all the writerly warmth. I have made new friendships, renewed old ones, and have a pile of fantastic giveaway and purchased novels. But most importantly, I am freshly charged with enthusiasm to complete my writing goals for the remainder of the year.